Twenty New Hampshire companies have been named to the Inc. Magazine’s list of the 5,000 fastest-growing private companies in the U.S., with one of the companies making its way to the top 500. The number of companies making the list has dropped significantly in the last couple of years, down from 31 companies in 2012 and 24 companies in 2013. But Salem-based RocketDrop ranked higher than any New Hampshire company had in recent years. The wholesale distributor of consumer electronics, such as smartphones, tablets and gaming consoles, was ranked at No. 161, taking the top spot in the state. The company achieved an eye-boggling three-year growth of 2,519 percent. The average growth rate for the 5,000 companies is 516 percent. The last time a New Hampshire company scored higher was in 2009, when GourmetGiftBaskets.com achieved the 37th spot, with 3,260 percent growth. That year, seven companies in the Granite State made the top 500. Last year, Waveguide was the highest ranked, at 1,066th. Inc. reported the aggregate revenue of the 5,000 firms is $211 billion, generating 505,000 jobs over the past three years. 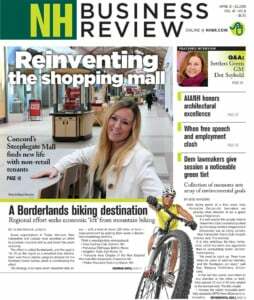 The 20 New Hampshire firms pulled in about $1.3 billion in revenue last year and generated 2,386 jobs over the past three years. • No. 161 – RocketDrop, Salem. Three-year growth: 2,519 percent. 2010 revenue: $2.7 million. 2013 revenue: $72.6 million. Employees: 15. • No. 738 – Body Armor Outlet, Salem. Three-year growth: 620 percent. 2010 revenue: $334,925. 2013 revenue: $2.4 million. Employees: 12. • No. 953 – Edge Velocity, Salem. Three-year growth: 473 percent. 2010 revenue: $349,275. 2013 revenue: $2 million. Employees: 9. • No. 1,733 – RE/MAX Insight, Salem. Three-year growth: 241 percent. 2010 revenue: $767,052. 2013 revenue: $2.6 million. Employees: 3. • No. 2,070 – Direct Capital, Portsmouth. Three-year growth: 194 percent. 2010 revenue: $147 million. 2013 revenue: $432.7 million. Employees: 227. • No. 2,174 – Mainstay Technologies, Belmont. Three-year growth: 183 percent. 2010 revenue: $1.7 million. 2013 revenue: $4.8 million. Employees: 39. • No. 2,410 – Private Jet Services Group, Seabrook. Three-year growth: 160 percent. 2010 revenue: $16.3 million. 2013 revenue: $42.3 million. Employees: 42. • No. 2,519 – The Nagler Group, Bedford. Three-year growth: 150 percent. 2010 revenue: $2.5 million. 2013 revenue: $6.4 million. Employees: 21. • No. 2,587 – Legacy Supply Chain Services, Portsmouth. Three-year growth: 145 percent. 2010 revenue: $140 million. 2013 revenue: $343.3 million. Employees: 2,700. • No. 2,587 – The Hype Agency, Salem. Three-year growth: 139 percent. 2010 revenue: $2.1 million. 2013 revenue: $5.1 million. Employees: 276. • No. 2,700 – The Bean Group, Portsmouth. Three-year growth: 139 percent. 2010 revenue: $7.5 million. 2013 revenue: $17.9 million. Employees: 18. • No. 2,863 – Planet Fitness, Newington. Three-year growth: 129 percent. 2010 revenue: $92.3 million. 2013 revenue: $211 million. Employees: 700. • No. 3,481 – Smartware Group, Center Harbor. Three-year growth: 95 percent. 2010 revenue: $1.7 million. 2013 revenue: $3.4 million. Employees: 27. • No. 3,544 – easyBackgrounds, Newfields. Three-year growth: 92 percent. 2010 revenue: $1 million. 2013 revenue: $2 million. Employees: 12. • No. 3,823 – Customer Centricity, Hudson. Three-year growth: 81 percent. 2010 revenue: $2.4 million. 2013 revenue: $4.5 million. Employees: 17. • No. 3,908 – GourmetGiftBaskets.com, Kingston. Three-year growth: 78 percent. 2010 revenue: $11.5 million. 2013 revenue: $20.5 million. Employees: 58. • No. 4,040 – Lawn Dawg, Nashua. Three-year growth: 73 percent. 2010 revenue: $6.8 million. 2013 revenue: $11.8 million. Employees: 108. • No. 4,341 – Demanko HLC Logistics, Londonderry. Three-year growth: 63 percent. 2010 revenue: $2.8 million. 2013 revenue: $4.7 million. Employees: 9. • No. 4,467 – Adaptive Communications, Portsmouth. Three-year growth: 59 percent. 2010 revenue: $36.1 million. 2013 revenue: $57.4 million. Employees: 41. • No. 4,547 – Highland Forwarding, Londonderry. Three-year growth: 56 percent. 2010 revenue: $10.7 million. 2013 revenue: $16.7 million. Employees: 26.